NASA and contractor engineers are on hand at the Firing Room 4 Integration Console as operations to power down space shuttle Endeavour for the final time are under way in Orbiter Processing Facility-2 at NASA’s Kennedy Space Center in Florida. Standing, from left, are Alex Pandelos of QinetiQ North America and John Apfelbaum, Bob Walker and Michael Ciannilli of NASA. Seated, from left, are John McClellan and former test project engineer Greg Koch of United Space Alliance and Debbie Awtonomow of NASA. 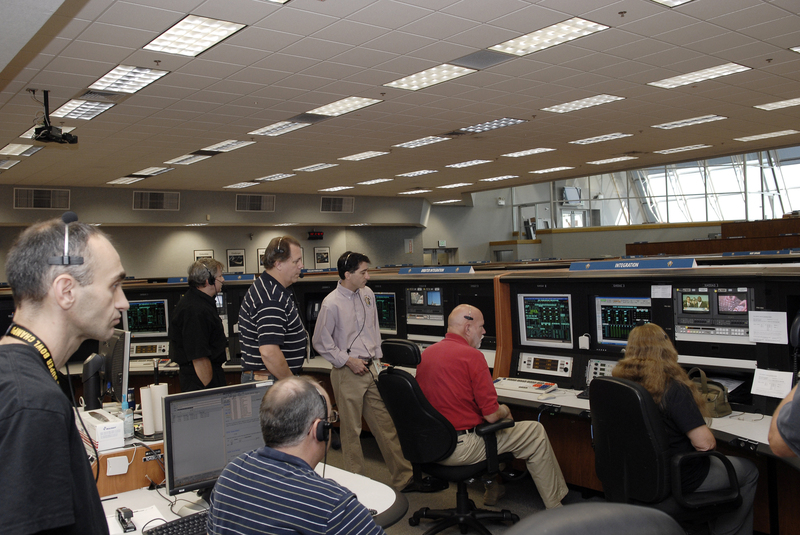 The Integration Console manages all orbiter systems including those needed for shuttle power up and launch. Endeavour is being prepared for public display at the California Science Center in Los Angeles. Its ferry flight to California is targeted for mid-September. Endeavour was the last space shuttle added to NASA’s orbiter fleet. Over the course of its 19-year career, Endeavour spent 299 days in space during 25 missions.